Sure, you'll abandon your New Year's Resolutions by the end of January, but if you're going to make some anyway, why not base them off of something as awe-inspiring and fantastical as Star Wars? That being said, here are 5 quotes that, while not really "resolutions," in and of themselves, make for some great nuggets of wisdom to keep in mind during this next year. 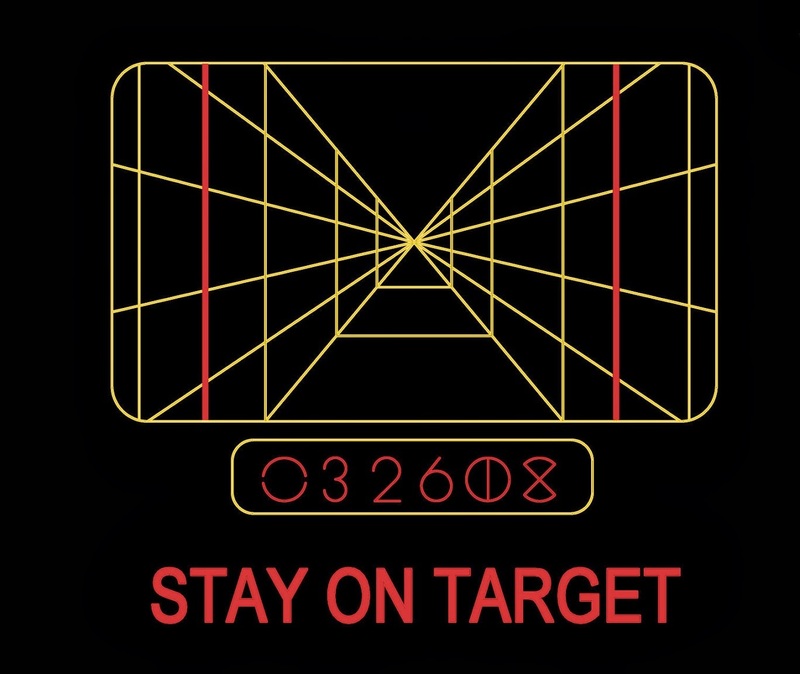 For my first Star Wars resolution suggestion, I choose the Episode 4 epitaph "Stay on Target." This three-word motto can mean a variety of different things, but for me it means to not abandon the things I've been working on since last year! Like this blog for instance. For my second pick, I had to go with another classic from the original of the original trilogy. Han's wise words to Luke were simple: "Don't get cocky." That's a good a resolution as any, and if you plan on staying on target with last years dreams and goals make sure you don't let your vision get clouded with delusions of grandeur (yep, that was a runner up for this list). Going with a similar theme, I think it's important to remember that there's always a bigger fish. This means two things. First, it means that no matter how ambitious your are, there's always going to be someone who's more "ambitious," than you (see #2). And second, more importantly it means that you don't need to worry about the big fish, because even they are dwarfed by some other fish. Don't waste your time this next year comparing yourself to other fish. Let the big fish worry about bigger fish while you focus your energies on personal projects and improving yourself. I know, I already featured a Qui Gon quote, but he's got some pretty good anecdotes hidden within Episode One. A favorite of mine is this: Your focus determines your reality. Like I alluded to above in #3, this next year you don't need to focus on the those around you because, well, your focus determines your reality. If you only focus on what others are doing you're likely to never get anything done yourself. 5. 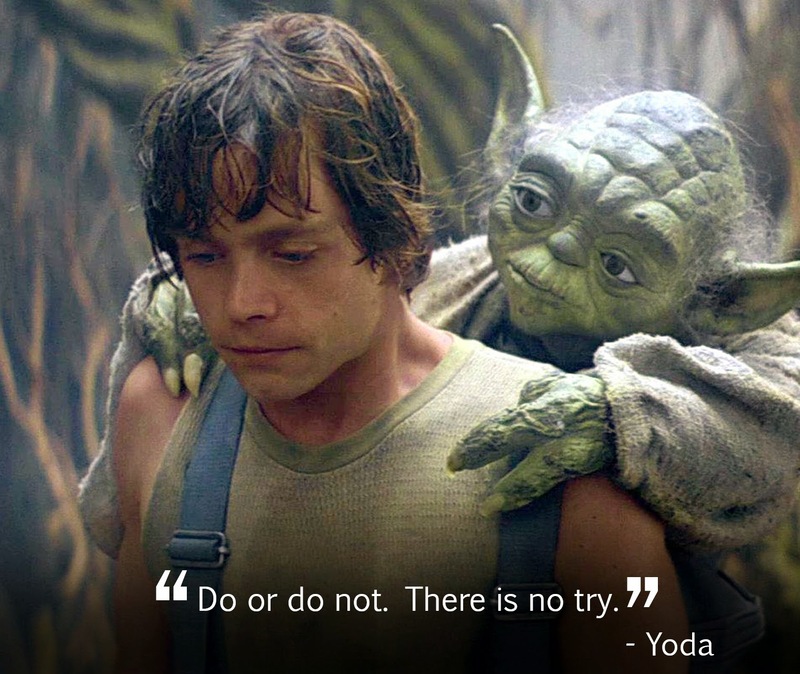 Do or do not. Finally, as is to be expected, the best New Year's goal you can make is to "do or do not." And I mean this in two ways. First, choosing now what you want to do next year is, of course, a wise thing to do. But more importantly, actually "doing," what you set out to accomplish (as opposed to just trying) is obviously paramount to accomplishing anything. So, this next year, remember to try less, and do more. And those are my five quotes that I'll be carving into my arm (not literally) to get me through this next year. Did I miss your favorite quote? Let me know in the comments below, and thanks for reading.